"There's no doubt about it. Wars must be very amusing." King Vidor was no stranger to the epic, having directed them since the silent days. He demonstrates a sure hand at the helm of this star-studded adaptation of Leo Tolstoy's massive novel of the Napoleonic Wars. The story follows three friends from the period 1805 to 1812, from Austerlitz to the French retreat from Moscow. 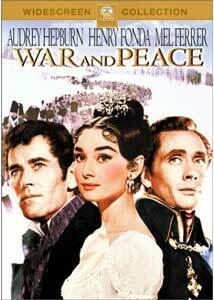 Idealist and pacifist Pierre Bezukhov (Henry Fonda) is an admirer of Napoleon (Herbert Lom) at first; Prince Andrei Bolkonsky (Mel Ferrer) is a cynical military man feeling the hand of doom upon him; and Natasha Rostova (Audrey Hepburn) is a young girl coming of age and falling in love first with Andrei, then with the dissolute (and married) Anatol Kuragain (Vittorio Gassman). The advent of the French upon Russia, however, produces fear as the army commanded by the elderly General Kutuzov (Oscar Homolka) fails to stop Napoleon at the bloody battle of Borodino. Yet Napoleon counts on neither the tenacity of the Russian people nor the ferocity of the Russian winter. Running at about half the length of Sergei Bondarchuk's massive 1965-67 adaptation, this shorter version does benefit somewhat from its conciseness. Forced to be economical, this version makes some of the relationships and motivations of the characters much clearer, to the benefit of the viewer. The screenplay (also headed by Vidor) is generally faithful to the book, although in true Hollywood fashion, an imaginary final battle needs to be added to the mix. This version tends to focus more on the peace side of matters, with the battles seen only briefly. That's probably for the best, for despite being an epic, the budget did not allow for the massive battles that Bondarchuk recreated. There are a few large-scale sequences, but much of the battle footage is plainly shot on a phony-looking soundstage, which doesn't impress one with the production values. While the cast is heavily loaded with star power, there are some issues. Most of the players seem to be aware that they're in A Great Book, and accordingly much of the dialogue is given in a declamatory manner that is not only unrealistic, but tiresome. Though far too old for the part, Hepburn is at her most waifish and comes off rather better than Fonda and Ferrer (then her off-screen husband). The latter in particular is stiff and unlikeable; beyond his wavy hair and a flashy uniform, it's hard to see what young Natasha would see in him. Helping matters significantly is the use of great character actors in some prime spots, most notably Homolka and Lom. The opposing generals are given a vivid life here, a humanizing detail that provides a little bit of thematic continuity with Tolstoy's historiography, all of which is otherwise excised in this Cliff's Notes version. The Nino Rota score is heavily derivative of Tchaikovksy's 1812 Overture, written to commemmorate many of the same events depicted here. The camera tends to be fairly active, particularly in the battle scenes, and the combat is much easier to follow here than it is in the Russian film. In all, the film manages to hit most of the high points well enough, and is thus an adequate substitute for the more epic version, for those not willing to invest the full seven hours. Image Transfer Review: For the most part, the film looks pretty good. The color palette is mostly pastel, without hard or bright colors (though these are occasionally present). Excellent detail and texture are visible, and shadow detail is quite good. There is occasional speckling, but there are two highly annoying artifacts present. One is a bright splotch in the middle of the screen that runs throughout the sequence when Natasha meets Kuragin at the opera, and the second is a light vertical stripe during the wolf hunt sequence. Both last several minutes and are irritating defects on an otherwise nice transfer. Audio Transfer Review: The 2.0 mono track is adequate for the most part. There is a prominent hiss throughout, but dialogue is clear at all times. Music has a rather muddy sound at times, seeming somewhat compressed and clipped. There is an impressive amount of bass during the cannon fire, however. Extras Review: Not much is included for extras. A brief (3m:36s) "making of" in black & white, from the period, apparently functioned as a teaser trailer. It includes some interesting footage of shooting the battle sequences (which actually look more impressive than anything that ended up in the film), and a brief message from Vidor himself. A re-release trailer in anamorphic widescreen is also included. Chaptering is a bit light for a film of this length. A star-filled Hollywood version of Tolstoy's epic novel, given a good transfer for the most part, though not much for extras.